Some of the weather and location terms will be unfamiliar to you, so I will give some explanation and background. Latitude: imaginary lines that run horizontally (think of the horizon) on a map or globe and are sometimes called parallels because they are always the same distance from each other. To remember which direction the lines run, think of the rungs of a ladder (ladder-tude). They begin at zero at the equator and continue to 90 degrees at each pole. Each degree is equivalent to about 69 miles. Longitude: imaginary that run vertically. They are also called meridians. Longitude lines are not parallel because they meet at the north and south poles. Zero degrees longitude is found at Greenwich, England, and the meridians meet at 180 degrees in the Pacific Ocean and the International Date Line. Latitudes are also called parallels and are horizontal. 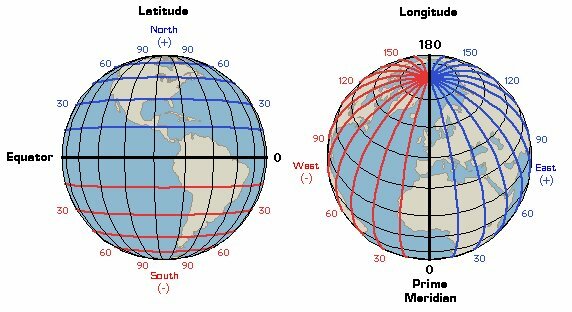 Longitudes are also called meridians and are vertical. Knots: another way to measure speed, like miles-per-hour, often used by mariners. It is equal to one nautical mile, 2,000 yards, and approximately 1.151 mph. The word knots dates back to the days when sailors would toss a log, attached to a rope knotted at regular intervals, off the stern of a ship. The sailors would count the number of knots that passed through their hands in a certain period of time, and that number was used to express the ship’s speed. Students (and parents) who have visited St. Mary’s City have seen exactly how this works! Celsius: a way to measure temperature. The freezing point for Celsius is 0 degrees, and the boiling point is 100 degrees. Alternatively, the freezing point for Fahrenheit is 32 degrees, while the boiling point is 212 degrees. Celsius can be converted to Fahrenheit by multiplying the starting degrees Celsius by 9, then dividing that number by 5. The last step is to add 32, and your answer is the equivalent degrees in Fahrenheit. Salinity: the amount of dissolved salt in the water. It is measured in PSU, which stands for Practical Salinity Units. Ocean water normally is made up of 3.5% salt, and contains 35 PSUs. The salinity of the water affects the electrical conductivity of the water (how well electricity can pass through water). Oregon II is forty-six years old, having been launched in February 1967. It is 170 feet long and 34 feet wide, with a welded steel hull. Oregon II weighs 703 tons with all of its equipment on board. The ship has a cruising speed of 12 knots, and is capable of traveling 7,810 nautical miles, and staying out for 33 days. 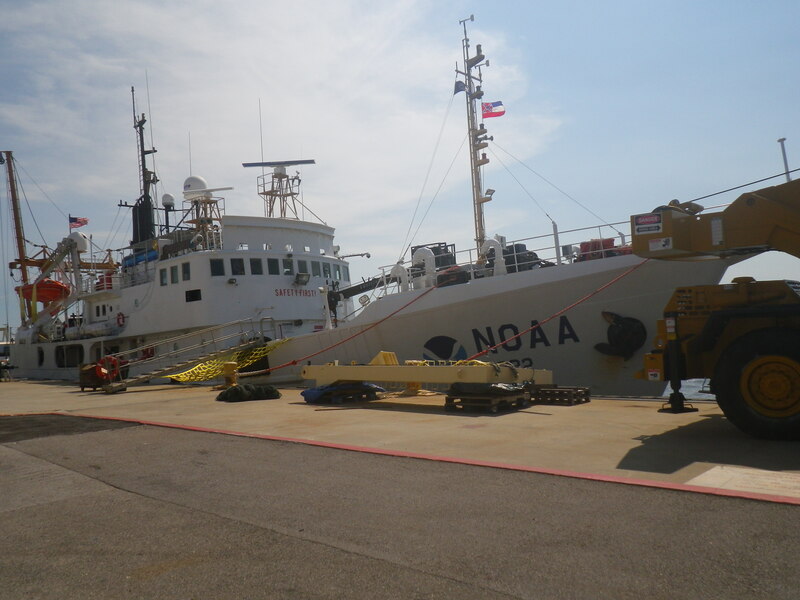 It was built for NOAA as a science ship and contains an oceanographic wet lab, a specimen lab, an instrumentation lab, and a hydrographic lab. With sleeping space for 31 people, up to twelve are usually scientists. 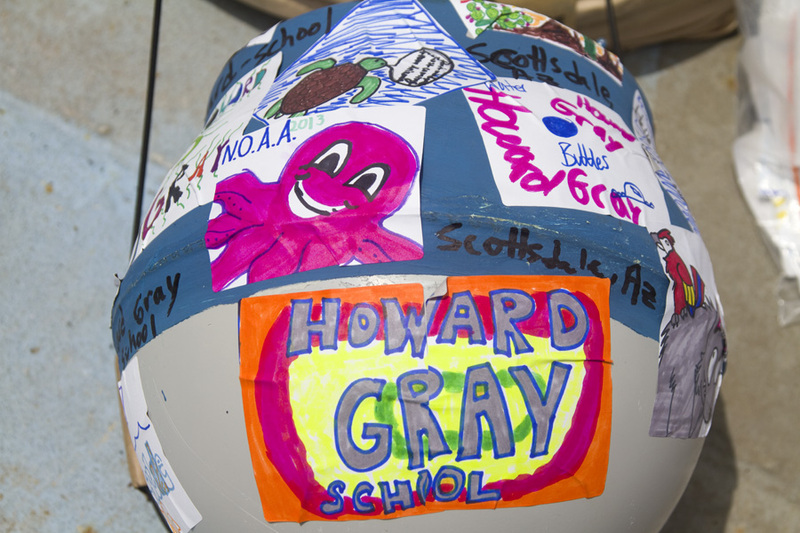 Scientists include Teachers at Sea, college student volunteers, interns, and other volunteers. To learn more about the ship, visit the Oregon II website. You may also track our progress by visiting http://shiptracker.noaa.gov/shiptracker.html and choosing Oregon II. I arrived in the small town of Pascagoula, Mississippi on Monday night. On Tuesday morning I received an email from Kim, the chief scientist, letting me know that a welcome aboard meeting was scheduled for 12:30 the next day, but that a crucial piece of equipment, the J frame, was broken and we would be unable to leave before it was fixed. Either way, I was going to “check in” to my cabin on the ship on Tuesday afternoon, and hope our departure would not be delayed. I met one of the scientists, Alonzo, on Tuesday afternoon and he gave me a tour of Oregon II, as well as NOAA’s (National Oceanic and Atmospheric Association) National Marine Fisheries Service, Pascagoula Lab. I met many people, from the unit leader of the trawl surveys, to the receptionists, who do much more than answer telephones. There were the plankton scientists, the marine mammal specialists, and the seafood inspection scientists, to name a few. The NOAA building was destroyed in Hurricane Katrina several years ago. After working out of trailers for about four years, the staff in Pascagoula moved into a beautiful new building overlooking The Pascagoula River. The ship, though, was of even greater interest to me, since I would be spending ten days aboard her. As we approached the gangplank, I saw that the J frame, normally attached to the side of the ship, was dismantled on the dock. Things were not looking too hopeful. In spite of that, I was excited to see the rest of the ship. We saw the bridge, where the ship’s master, also referred to as the commanding officer (CO), and the NOAA Corps officers who pilot the ship spend a lot of time. The stern of the boat (the rear) is where much of the science work is done. The outriggers, a pair, sit high up on the ship, towards the back, and can be extended out to the sides for the groundfish collection. As we walked inside from the stern, we saw the wet lab, where fish and sea life are measured and sorted, and the dry lab, where much of the data is recorded. 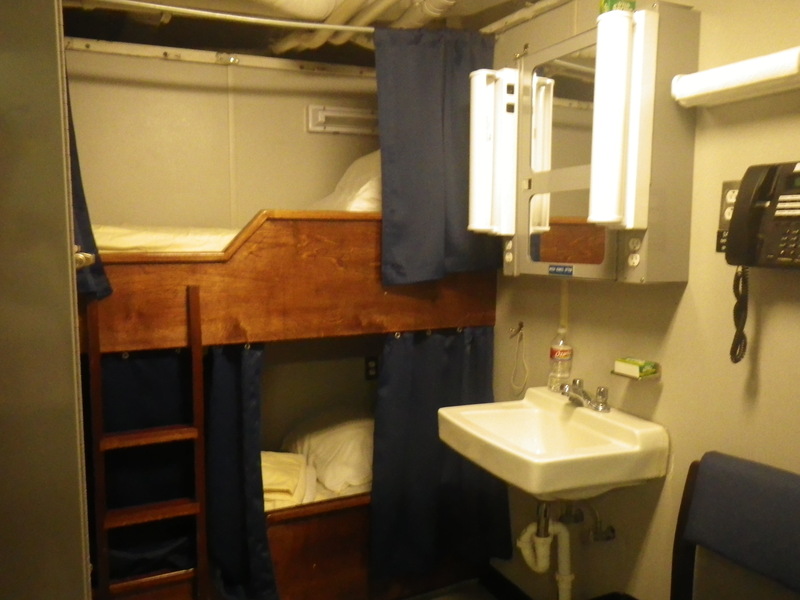 Certain personnel onboard are important enough to have a private cabin (the master and the chief scientist, for example). Most of us, however, share a cabin with one other person, usually someone who works an opposite shift. For example, I am working the noon to midnight shift, and my roommate works the midnight to noon shift. This works to give us each a little bit of privacy and quiet while we are trying to sleep. As you can see, the beds are like little nooks built into the walls, and have heavy curtains to keep the light out if you are sleeping. There is actually plenty of storage space for our clothes. As you might expect, everything that opens has a hook or a locking mechanism on it. When the seas are rough, you don’t want drawers flying open! I share this room with a volunteer scientist. I work from noon to midnight, and she works from midnight to noon. Those of you who know me won’t be surprised that one of my favorite spots onboard is the galley! It only seats twelve, so with twenty-nine people onboard, the general policy is to “eat it and beat it”. There is a “chief steward” and a “second cook”, who make delicious meals and keep the galley stocked with snacks! Of course they do much more than that. The galley on Oregon II seats twelve. Wednesday morning there was much to do to be prepared for departure. Imagine going on a vacation to the beach for a week, but being unable to make a trip to the grocery store, drug store, mall, or even the doctor if someone gets sick. You must think of everything you need for ten days and bring it with you. The galley had to be stocked, as well as all paper products needed in other areas of the ship. The repaired (we hoped) J frame had to be re-installed, everyone who had not yet boarded and settled in had to arrive, cars had to be moved and people shuttled back, science materials had to be loaded and stored, and many other little things had to be done. At 12:30 p.m. we met in the crew’s lounge for a welcome aboard meeting, still assuming an on-time departure. The J frame had been installed and was being tested. At that time I met the other scientists, volunteers, and an intern. At 2:00 we all went out to the well of the boat to wave to those seeing us off, and we actually started to slowly pull away from the dock a little after 2:30. The tropical storm, Chantal, was at the back of the minds of many of us, and we would be heading in her direction. I knew, though, that if the storm looked like a problem, we would find a safe place to wait her out. 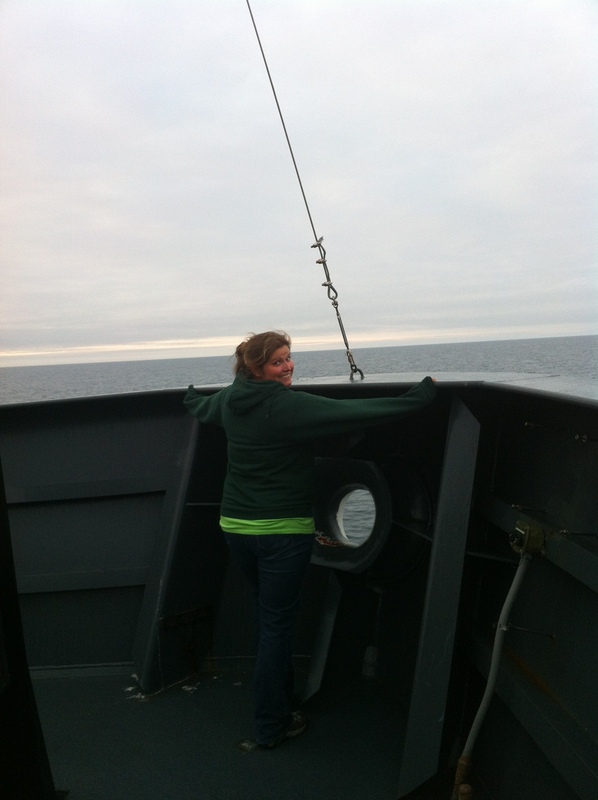 We were on a NOAA ship, after all. I am wearing my survival (or gumby) suit. It is a flotation device and keeps you warm, too. These are found in each cabin. 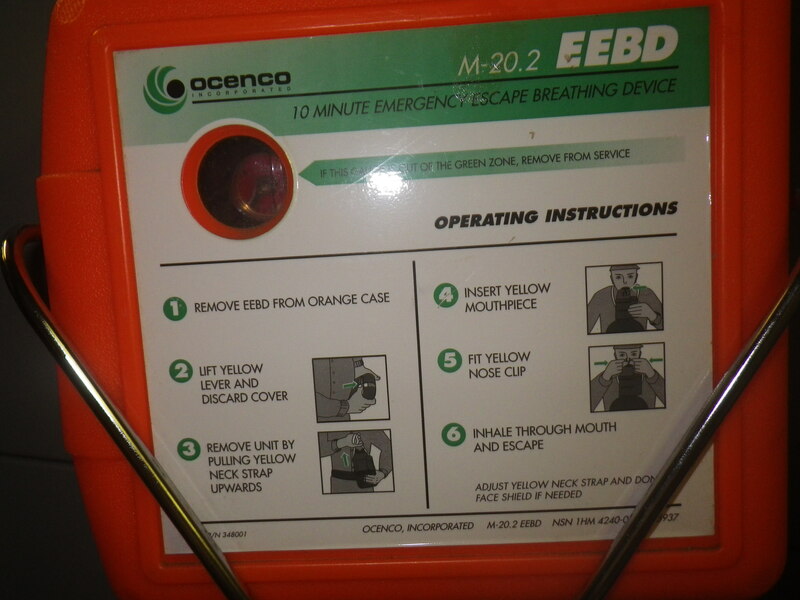 They provide at least ten minutes of air in the event of a fire or other emergency. Did you know that the bridge uses sonar, radar, AIS (Automatic Identification System), GPS, a magnetic compass, and electronic and paper charts to navigate to new locations? 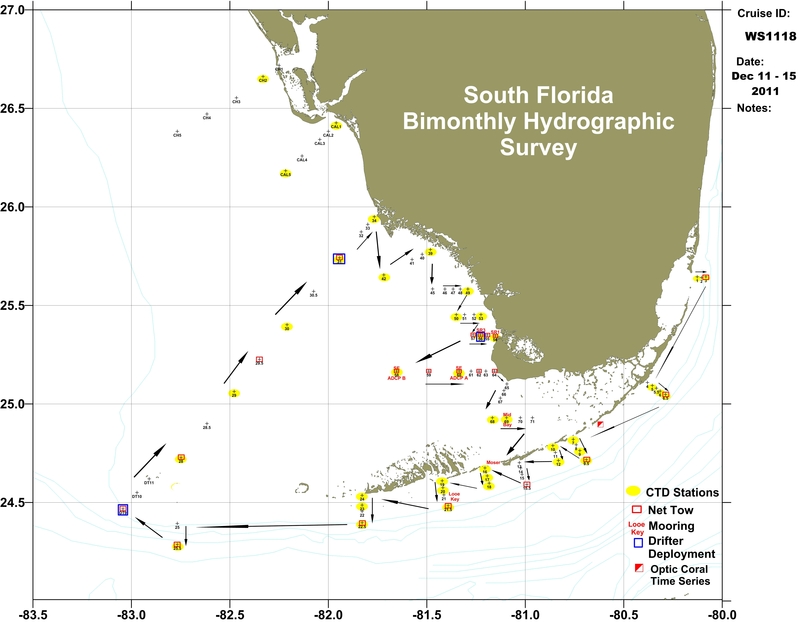 Charts are similar to maps, but include much more information such as the contours of the land below the water, obstructions in the water, buoys, oil rigs, rocks, and shoals. If the Oregon II is 170 feet long, about how many meters long is it? If the water temperature is 28 degrees Celsius, what is the temperature measured in Fahrenheit? We will be collecting plankton on this leg of the mission. How do you think we will preserve the plankton in order to get it back to the scientists? What questions do you have for me? I’ll do my best to answer them in my next blog entry. Thank you for visiting my blog. I hope you will check back in a few days for an update! Once we completed our mooring work from Gore Point through to Pavlof Bay, we sailed on to Unimak Pass, nearly 400 miles away, and then entered into the Bering Sea. Unimak Pass is a strait (wide gap) between the Bering Sea and the North Pacific Ocean in the Aleutian Island chain of Alaska. Upon arrival at our first station, we started the process of deploying our CTD sampling unit at predetermined points as well as MARMap Bongo casts(discussed in my next blog) when specified, within a region forming a rectangular “box” north of the pass. If you have been following my voyage using NOAA ship tracker, hopefully you now understand why we appeared to have been “boxed in” (I can hear the groans from my students even out here in the Bering Sea). It is important to understand the ocean waters of this region given that it is a major egress between the North Pacific Ocean and the Bering Sea. Therefore it serves as an important pathway between these two water bodies for commercially important fish stock as well as serving as a major commercial shipping route. A CTD (an acronym for conductivity, temperature, and depth) is an instrument used by oceanographers to measure essential physical properties of sea water. 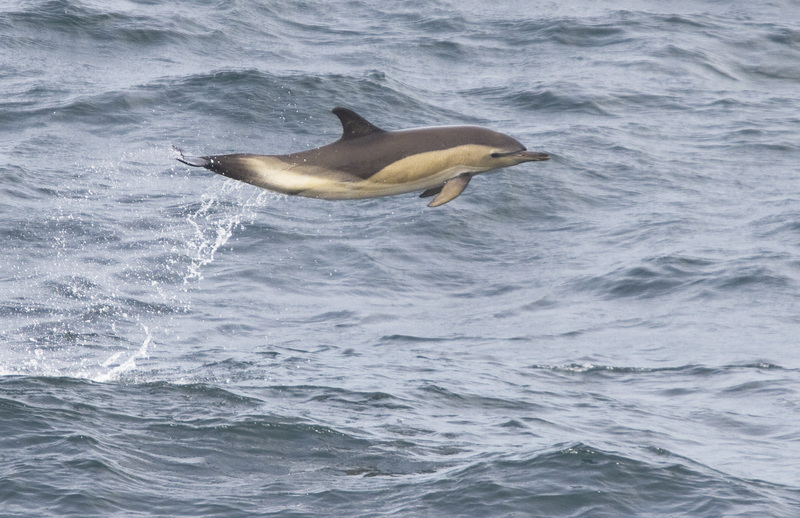 It provides a very comprehensive profile of the ocean water to help better understand the habitat of important marine species as well as charting the distribution and variation of water temperature, salinity, and density. This information also helps scientist to understand how variations in physical ocean properties change over time. The CTD is made up of a set of small probes attached to a large stainless steel wheel housing. 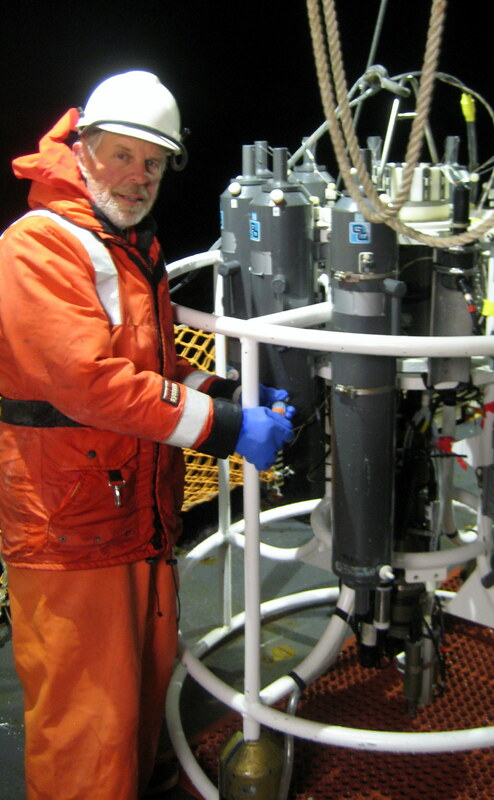 The sensors that measure CTD are surrounded by a rosette of water sampling bottles (niskin bottles) that individually close shut by an electronic fired trigger mechanism initiated from the control room on-board the ship. The rosette is then lowered on a cable down to a depth just above the seafloor. 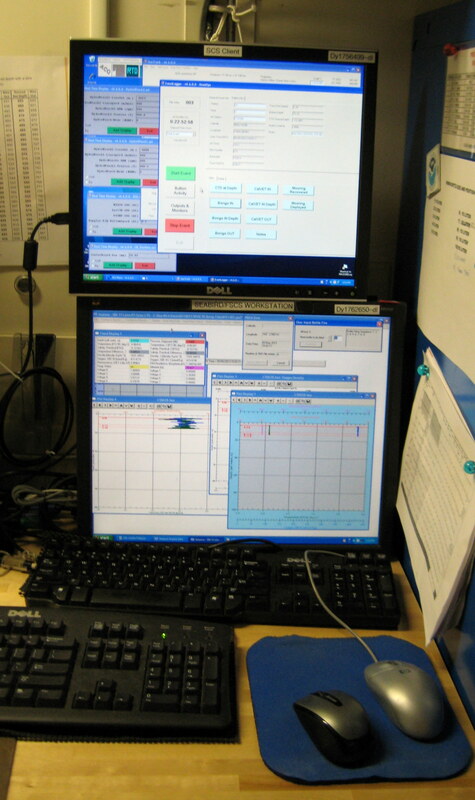 The science team is able to observe many different water properties in real time via a conducting cable connecting the CTD to a computer on the ship. 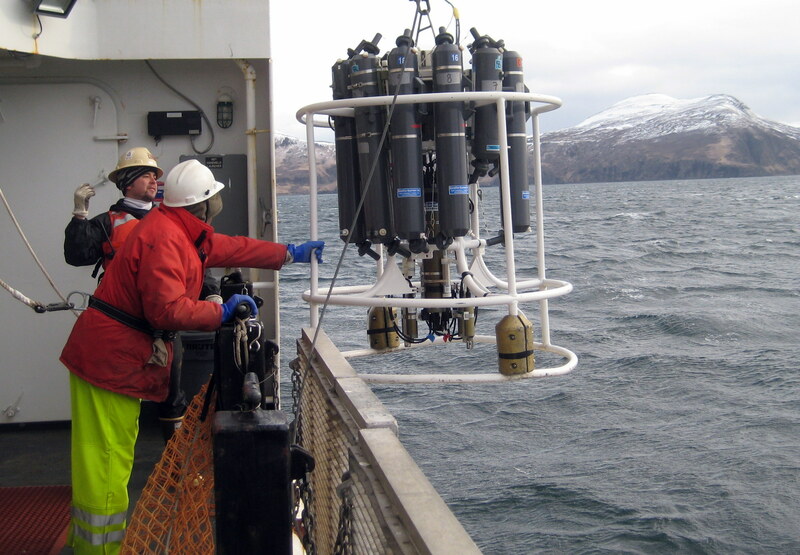 A remotely operated device allows the attached water sampling bottles to be closed (sample collected) at selective depths as the instrument ascends back to the surface. 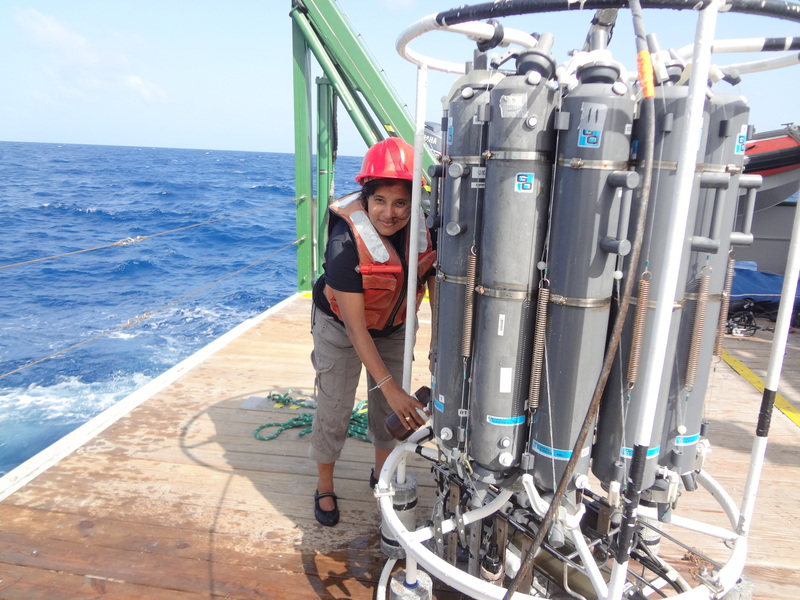 Here I am in my hot colored rain pants helping to deploy the CTD. Notice the niskin bottles? 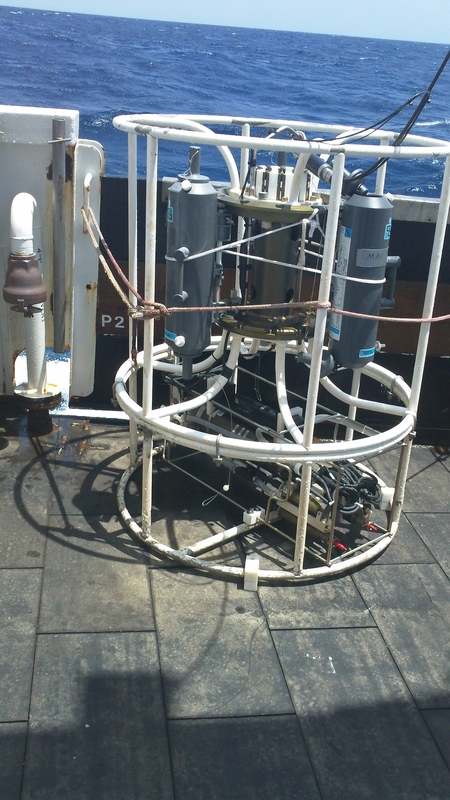 On this cruise, our CTD was equipped to collect real-time water column measurements of conductivity, temperature, density, dissolved oxygen, salinity, chlorophyll levels, and light as the unit traveled down through to a set point just above the ocean floor. Additionally, water samples for determining concentrations of nutrients (nitrate (NO3-1), nitrite (NO2-1), ammonium (NH4+), phosphate (PO4-3), and silicates (SiO4-4), dissolved oxygen, dissolve inorganic carbon, and chlorophyll were measured at specified depths within the water column as the unit was raised back to the surface. Replicate measurements of some chemical constituents measured on the ascent are completed to help support the reliability of the dynamic measurements of these same species made on the drop. All of the nutrient samples are then frozen to -80C and brought back to the lab on shore for analysis. Dissolved oxygen, dissolved inorganic carbon, and chlorophyll samples are also treated according to unique methods for later detailed analysis. The sampling begins from a niskin bottle! Our first CTD cast from the “Unimak Box” began with my shift, a bit after midnight, on May 3rd and ended 32 hours later on May 4th. The science crew worked nonstop as they completed 17 different CTD casts. Again, it was impressive to see the cooperation among the scientists as each group helped one another complete CTD casts, launch and retrieve Bongo nets, and then collect the many different samples of water for testing as well as the samples of zooplankton caught in the bongo nets. 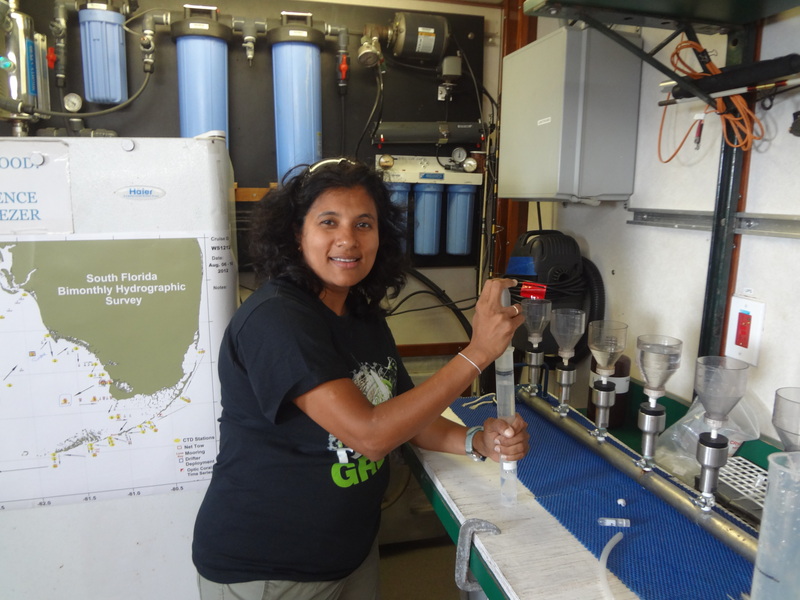 My task was to collect nutrient water samples from each CTD cast. 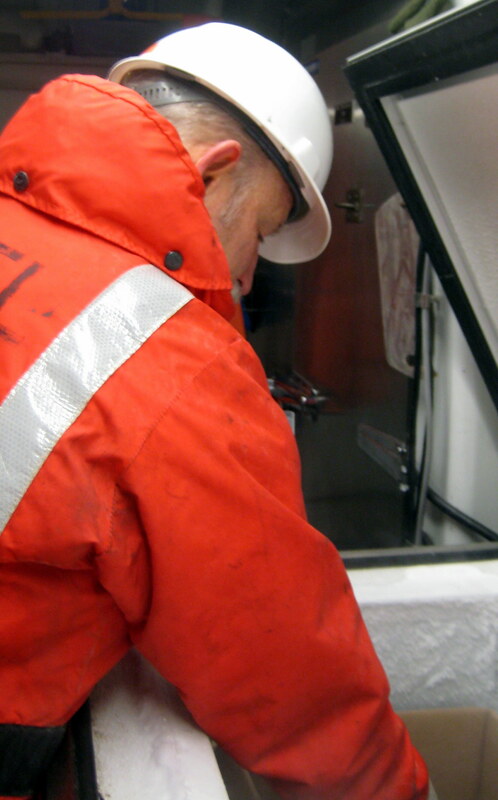 As the water depth increased so did the number of samples that were collected. 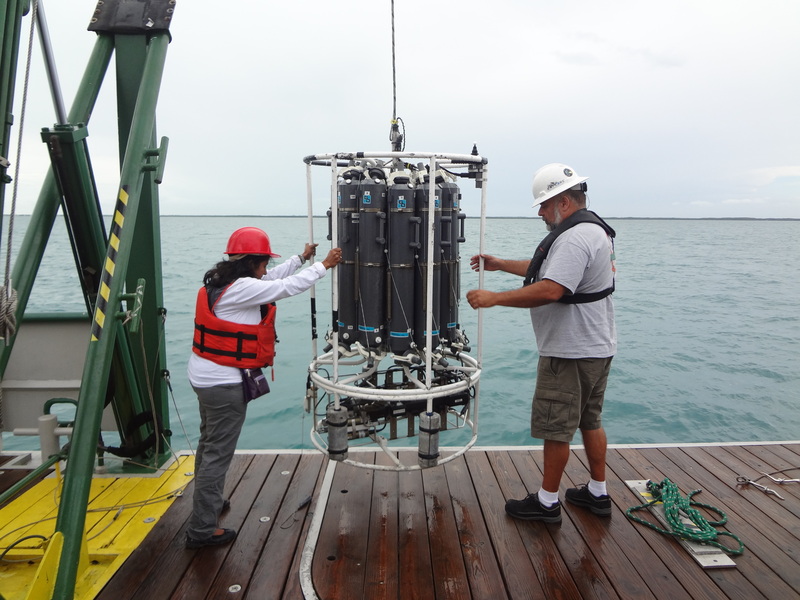 During our sampling water depths ranged from approximately 50 meters (5 samples) up to 580 meters (11 samples). 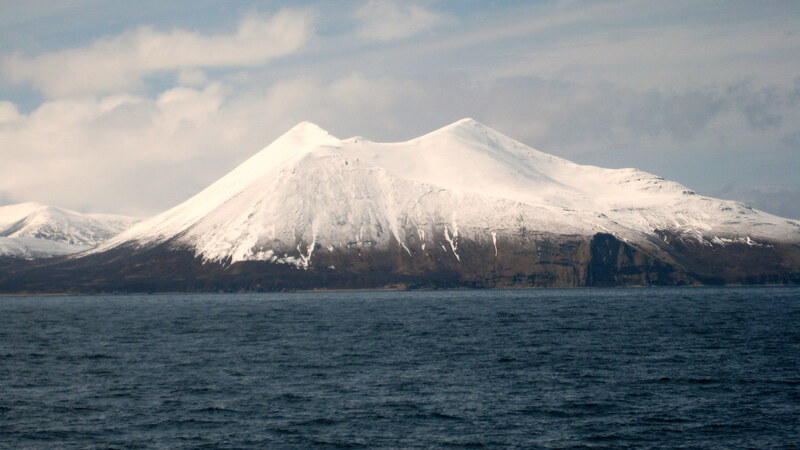 On our last cast the air temperature was -2.3o C with water temperature reading 2.90 C. Seas were relatively calm and we were able to see many different islands in the Aleutian chain. It was rewarding to be able to help the team collect water samples for nutrient testing, especially given that we are able to sample many of these same nutrient species in our chemistry lab at Franklin Pierce. I want my students to know that I practiced “GLT” when collecting nutrient samples making certain to rinse each sample bottle and sampling syringe at least three times before each collection. 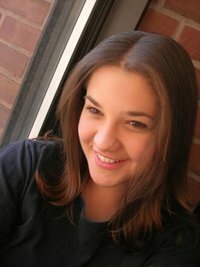 Want to know what “GLT” references…ask one of my students! My most “interesting” time on board ship happened during our first night of CTD testing along one of the lines of the Unimak Box. At 2:45 am Peter, Douglas, and I were recording flow meter values from the previous bongo net tow on the side quarter-deck. I was writing values down on a clip board as Peter read the values off to me. I happened to glance over the deck towards the sea when I noticed an unusually large wave about 2 meters out from the boat traveling towards us. Suddenly it crashed on top of us knocking us to the deck floor. Water flooded all around us and through the doors of our labs. I immediately grabbed onto one of the ship’s piping units and held on tight as the water poured back off the deck. In an instant the sea was calm again after the “rogue” wave released its energy on our ship. Because Peter and I fell onto the deck our clothes became completely soaked with icy cold seawater. 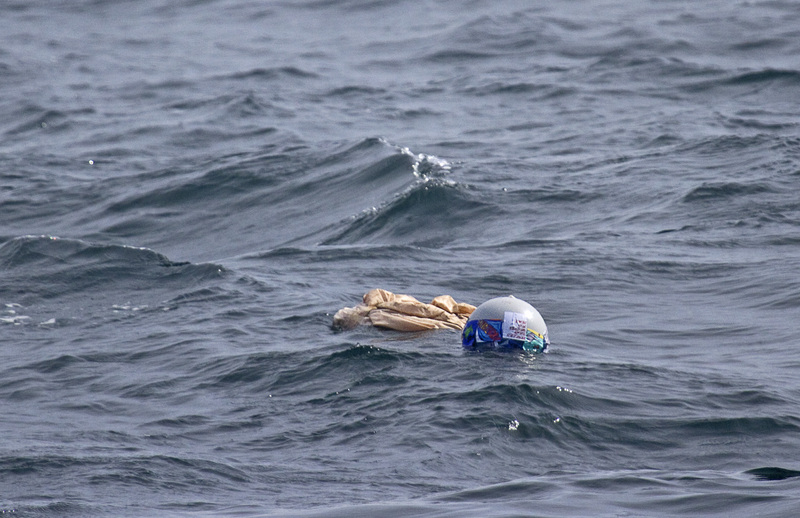 Upon standing, we checked on each other and then immediately began retrieving empty sampling bottles and other lab paraphernalia as they floated by in the water emptying off the deck. 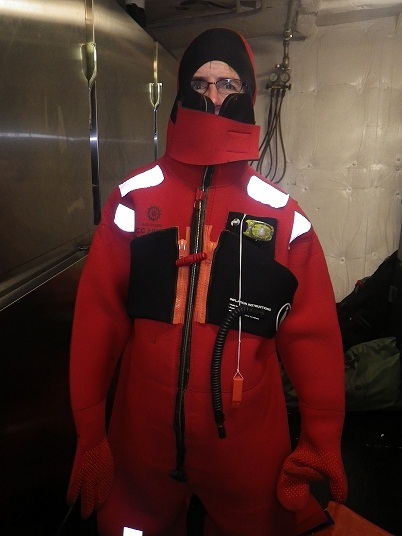 Douglas was able to hold-on to the CTD and remained standing and dry under his rain suit. This is the first, and I hope the last, “rogue” wave that I ever experience. Fortunately, no one was lost or injured and we were able to retrieve all of our equipment with one exception…the clip board of data log entries that I was holding! I must admit that I am disappointed at the limited internet access while on board ship. I find it somewhat disheartening that I have not been able to write the consistent blogs promised to you telling of my adventures. Hopefully this will improve as we change course and you will continue to follow along. View as I traveled to work! Not all islands are completely snow covered. Read my next blog to find out! Hello students! We know how to do water testing in our lab class using the testing kit. Today, I am going to explain to you the way ocean water is sampled and tested in the South Florida coastline. Our 5 day cruise consists of over 80 stations along the Atlantic and Gulf coast of Florida. 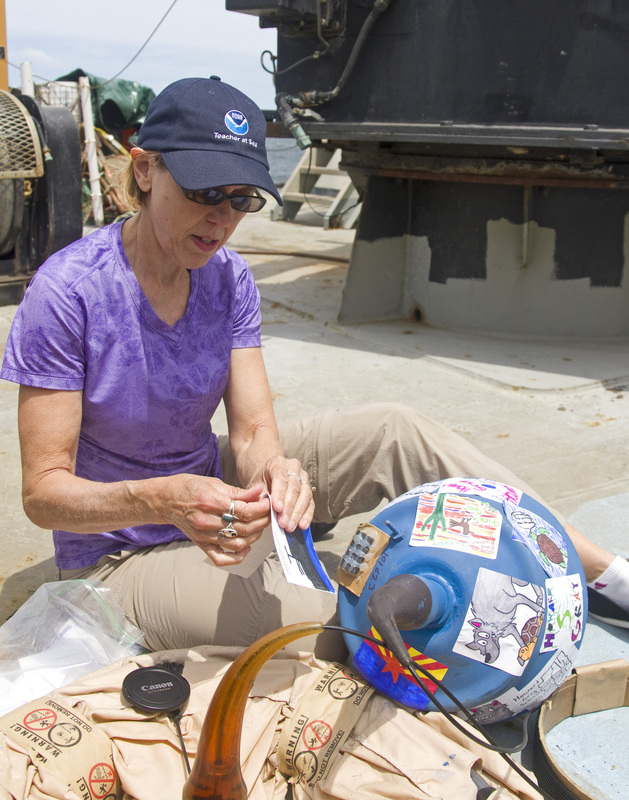 At each station we take water samples, and at about 20 of the stations we tow nets to catch fish, seaweed or plankton and sometimes scuba dive to recover the instruments mounted on the seafloor. 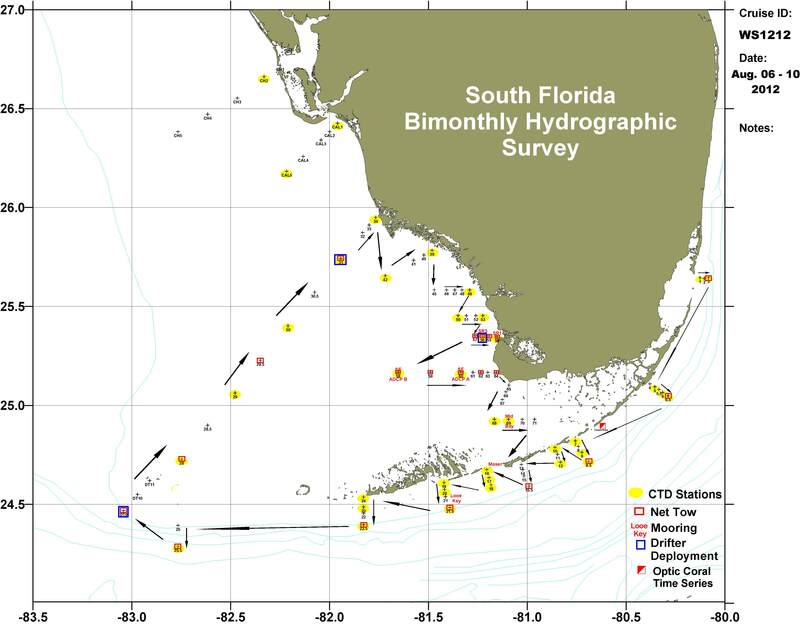 Our journey begins at station #2 at Dixie shoal, which is near Miami; you can see this on the South Florida bimonthly Hydrographic survey map below (see fig). 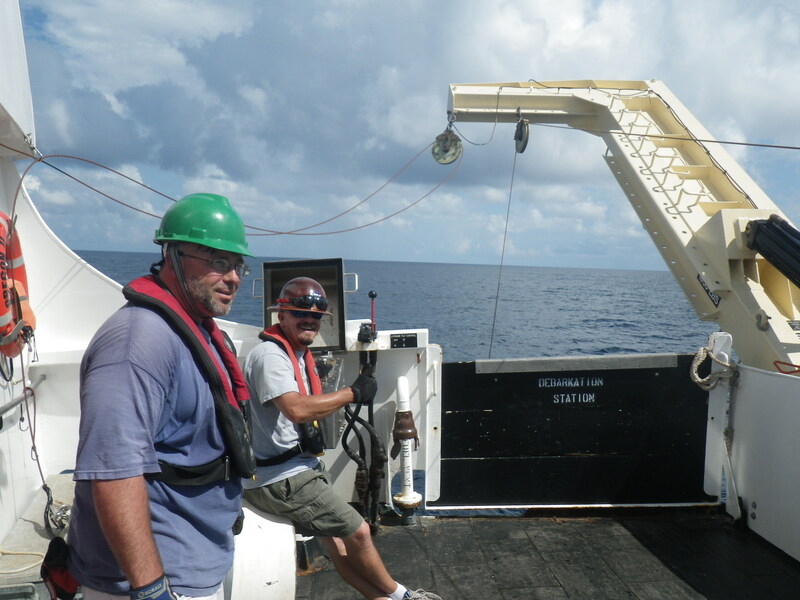 At each station we performed CTD (conductivity, temperature and depth) operations. The CTD is a special instrument to measure salinity, temperature, light, chlorophyll and the depth of water in the ocean. It is an electronic instrument mounted on a large metal cage that also contains bottles to collect samples. These bottles are called niskin bottles and every oceanographer uses them. They are made of PVC and are specially designed to close instantaneously by activation from the computer inside the ship. 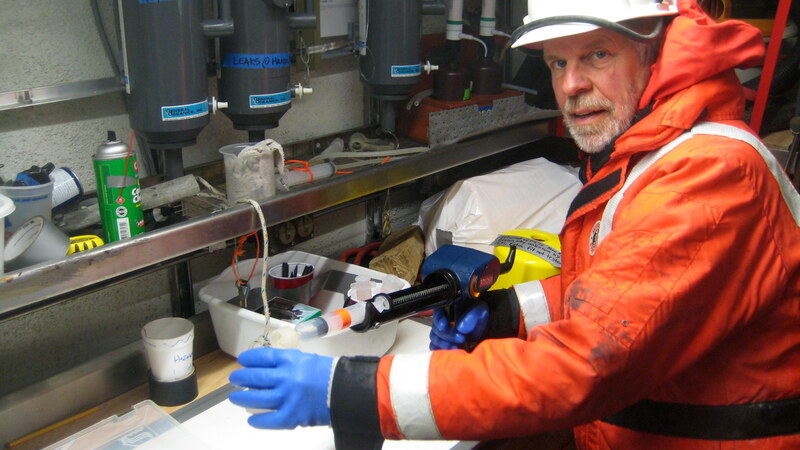 Collecting water samples at various depths of the ocean is important in order to verify in the lab that the instruments are working properly. Each bottle has an opening valve at the bottom and top to take in the seawater. The top and bottom covers are operated by a control system. Once a certain depth is reached, the person sitting at the control system triggers and it closes the bottles. You can control each bottles through this system to get a pure water sample from different depths. For example, when the ocean floor is 100 meters deep, water is sampled from the surface, at 50 meters deep, the very bottom. The CTD instrument is very large, and is operated by a hydraulic system to raise it, to place it and lower down into the ocean. Rachel (another fellow member) and I were the chemistry team; we wore hard hats and life vests while we guided the CTD in and out of the water. This is always a job for at least two people. The team usually closes several bottles at the bottom of the ocean, in the middle layer and surface of the ocean. We closed the bottles in the middle layer because the characteristics of the water are different from at the bottom and the surface. Remember, the ocean water is not all the same throughout, at different depths and locations it has different chemical characteristics. We closed two bottles per layer, just in case something happened with one bottle (it is not opened properly, for example) then the other bottle can be used. 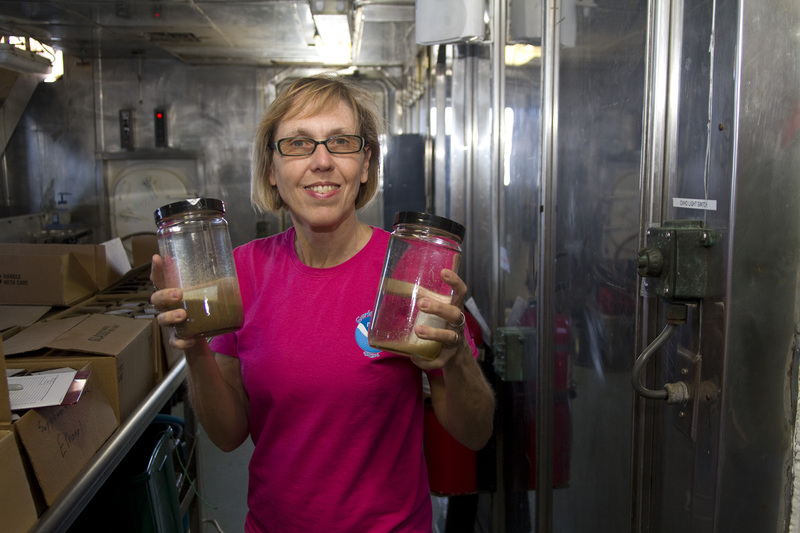 Rachel and I took water samples from the CTD bottles and used them in the lab to conduct experiments. Before I explain the analysis, I want to explain to you the importance of it, and how a “dead zone” can happen. Remember phytoplankton need water, CO2, light and nutrients to live and survive. The more nutrients, the more phytoplankton can live in water. As you all know, phytoplankton are at the base of the food chain. They convert the sun’s energy into food. Too many nutrients mean too much phytoplankton. If certain species of phytoplankton increase, it increases the chance of a harmful algal bloom. Too much of one kind of plankton called the dinoflagellates can release toxins into the water which harms the fish and other ocean life and it can even cause people to feel like they have a cold if they swim in the water that has those plankton. Large amounts of plankton die and fall to the sea floor, where bacteria decompose the phytoplankton. Bacteria use available oxygen in water. The lack of oxygen causes fishes and other animals die. The zone becomes ‘the dead zone’. We prepare the sample for nutrient analysis to measure nutrients such as nitrate, nitrite, phosphate, ammonium and silicate in the water. We also prepare the sample for chlorophyll analysis. In the lab, we filter the phytoplankton out of the water. Phytoplankton contains special cells that photosynthesize (chloroplasts) which are made of chlorophyll. If we know the amount of chlorophyll, we can estimate the amount of phytoplankton in a given area of the ocean. Phytoplankton needs carbon dioxide to grow. Carbon dioxide analysis is useful because it provides an estimate of total carbon dioxide in the ocean. It is also important in understanding the effects of climate change on the ocean. If you increase the amount of CO2 in the atmosphere (like when you drive cars), it enters into the ocean. If you think about a can of soda it has a lot of CO2 dissolved into it to make it fizzy, and it also tastes kind of acidic. This is similar to when CO2 dissolves into seawater. When the ocean becomes more acidic, the shells of animals become weaker or the animals cannot produce the shells at all. Colored dissolved organic matter (CDOM) analysis informs us where this water comes from. The dissolved organic matter comes from decomposing plants, and some of these dead plants entered the water through rivers. You can tell for example that water came from the Mississippi River because of the CDOM signal. You can then follow its circulation through the ocean all the way to the Atlantic. 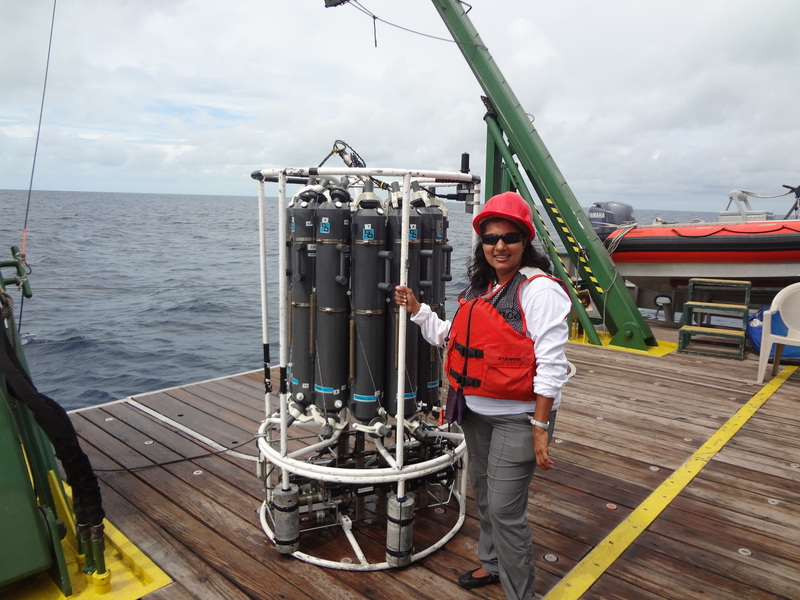 From the CTD instrument, we measured temperature, light, salinity, oxygen etc. and graphed it on a computer (see figure) to analyze it. Generally, I see that ocean surface water has high temperature but low salinity, low chlorophyll, and low oxygen. As we go deeper into the sea (middle layer), temperatures decrease, dissolved oxygen increases, chlorophyll and salinity increases. At the bottom layer, chlorophyll, oxygen, temp and salinity decrease. 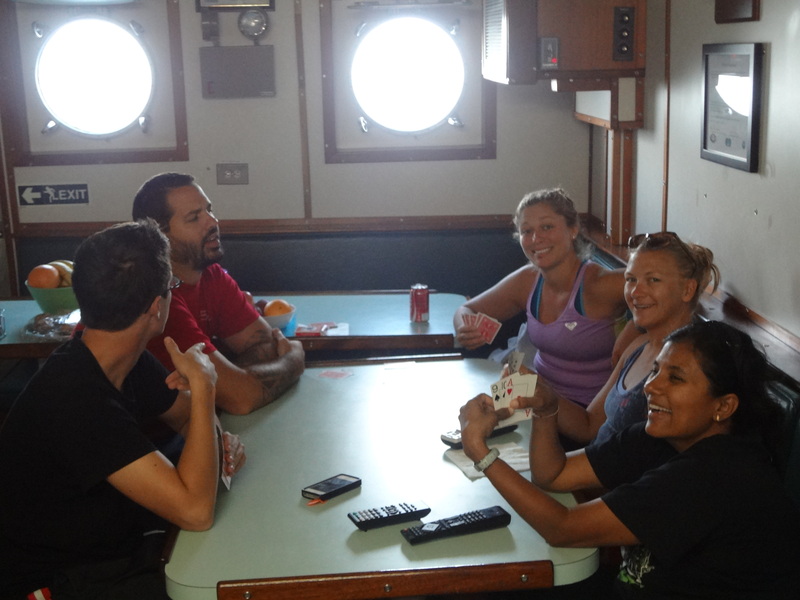 I arrived on the ship Sunday evening and met with other people on the team, tried to find out what we are going to do, how to set up, etc. Asked so many questions… I explored my room, the kitchen, the laundry, the science lab, the equipment, etc. Nelson (the chief scientist) gave me a really informative tour about the ship, its instruments and operations. He showed the CTD m/c, the drifter, the wet lab etc. He also gave me a tour of a very important instrument called the “flow-through station” which is attached to the bottom of the ship. This instrument measures temp, salinity, chlorophyll, CDOM, when the boat drives straight through a station without stopping. I was really stunned by how precise, the measurements taken by this instrument are. The next morning, Nelson explained that if we have enough tide the ship would leave. We had to wait a bit. As soon as we got the perfect tide and weather, R/V Walton Smith took off and I said ‘bye bye’ to Miami downtown. I learn so much every day in this scientific expedition. I saw not only real life science going on, but efficient communication among crew members. 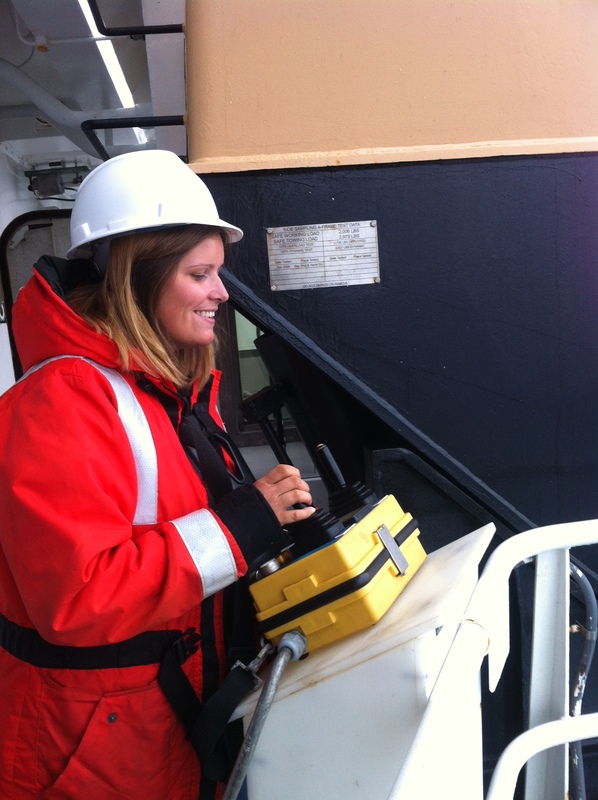 There are many types of crew members on the ship: navigation, technology, engineering, and scientific. Chief scientists make plans on each station and the types of testing. This plan is very well communicated with the navigation crew who is responsible for driving the ship and taking it to that station safely. The technology crew is responsible for efficient inner working of each scientific instrument. 10 minutes before we arrive on a station, the ship captain (from navigation crew) announces and informs the scientific team and technology team in the middle level via radio. So, the scientific team prepares and gets their instruments ready when the station arrives. I saw efficient communication and collaboration between all teams. Without this, this expedition would not be completed successfully. I have also seen that safety is the first priority on this oceanic ship. When any crew member works in a middle deck such as CTD, Net Tow etc, they have to wear a hard hat and life jacket. People are always in closed toe shoes. 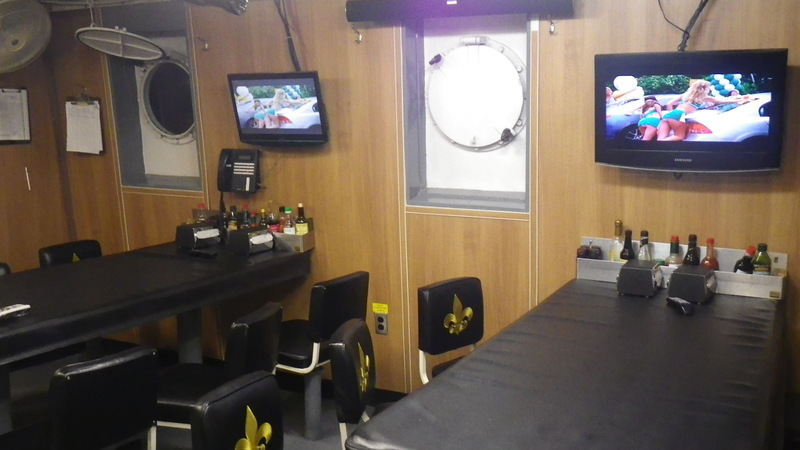 It is required for any first timer on the boat to watch a safety video outlining safe science and emergency protocol. People in this ship are very friendly. They are very understanding about my first time at sea, as I was seasick during my first day. I am very fortunate to be a part of this team. The food on the ship is delicious. Melissa, the chef prepares hot served breakfast, lunch and dinner for us. Her deserts are very delicious, and I think I am going to have to exercise more once I come back to reduce the extra weight gained from eating her delicious creations! My shift is from 5 a.m. to 5 p.m. and I work with Rachel and Grant. After working long hours, we watch TV, play cards and have dinner together. I am learning and enjoying this expedition on the ship Research Vessel Walton Smith. 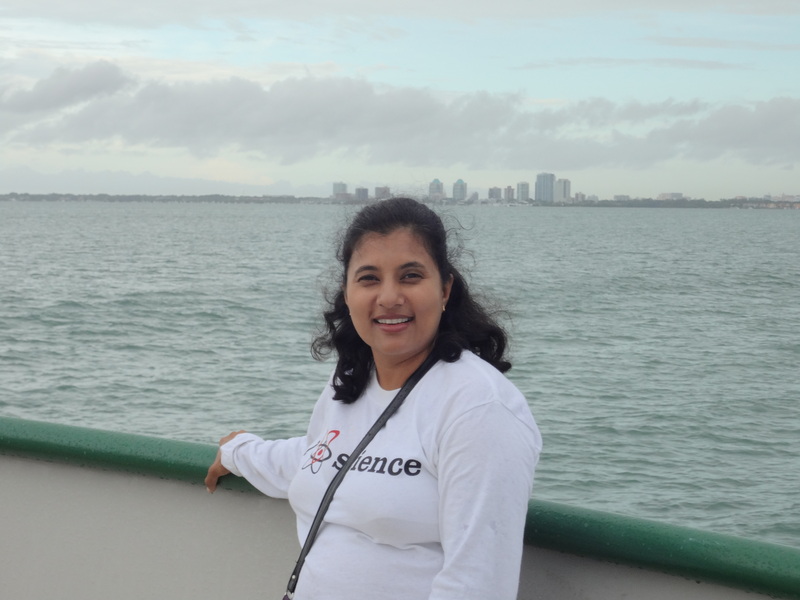 Why we do water testing in different areas of river and ocean? How to prevent dead zone in an ocean? In ship, ropes called lines, kitchen called galley, the place where you drive your ship is called bridge or wheel house. 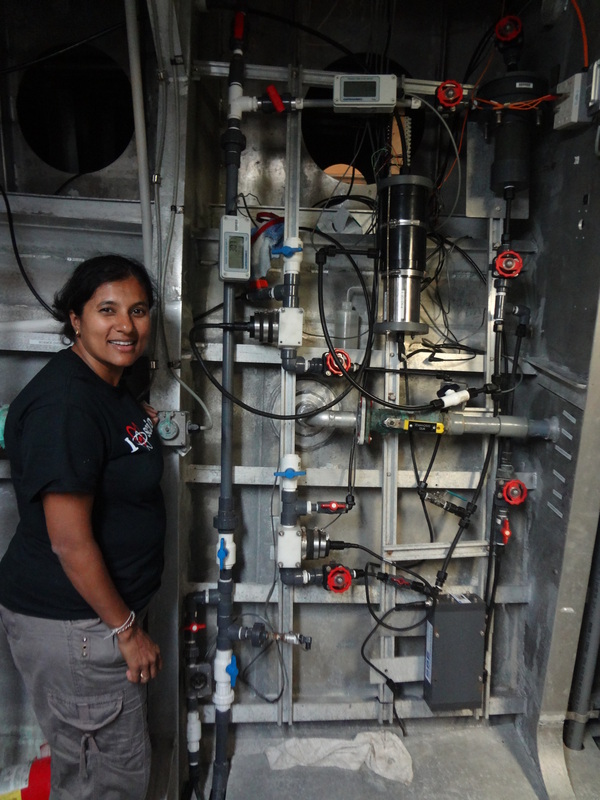 Today’s post is going to be about two of the water profiling devices used on board the Oscar Dyson: the CTD and XBT. CTD stands for Conductivity, Temperature, and Depth. 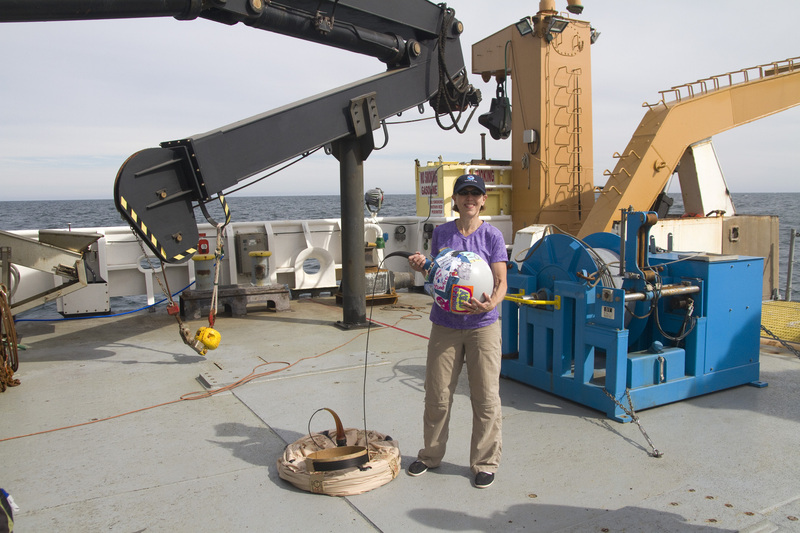 It’s actually a device that is “dropped” over the starboard side of the ship at various points along the transect lines to take measurements of conductivity and temperature at various depths in the ocean. 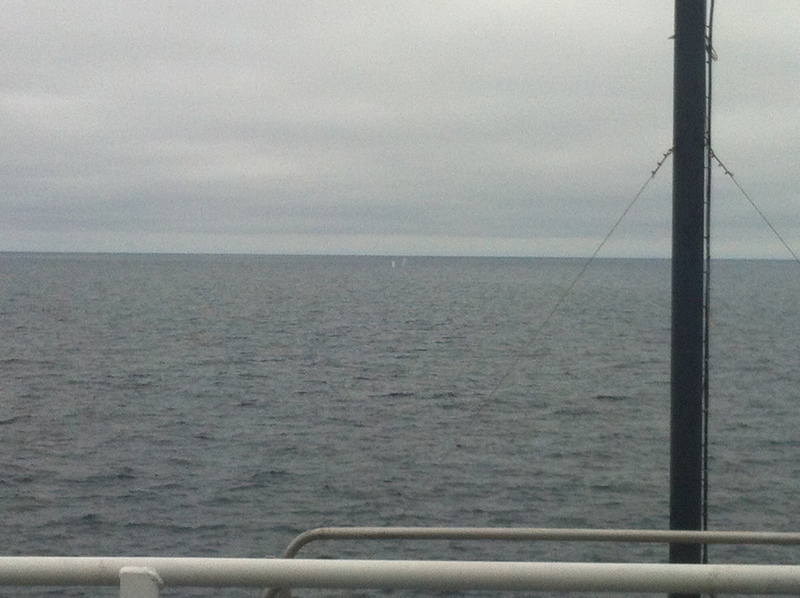 On this leg of the pollock survey, we will complete about 25-30 CTD drops by the end. The data can also be used to calculate salinity. 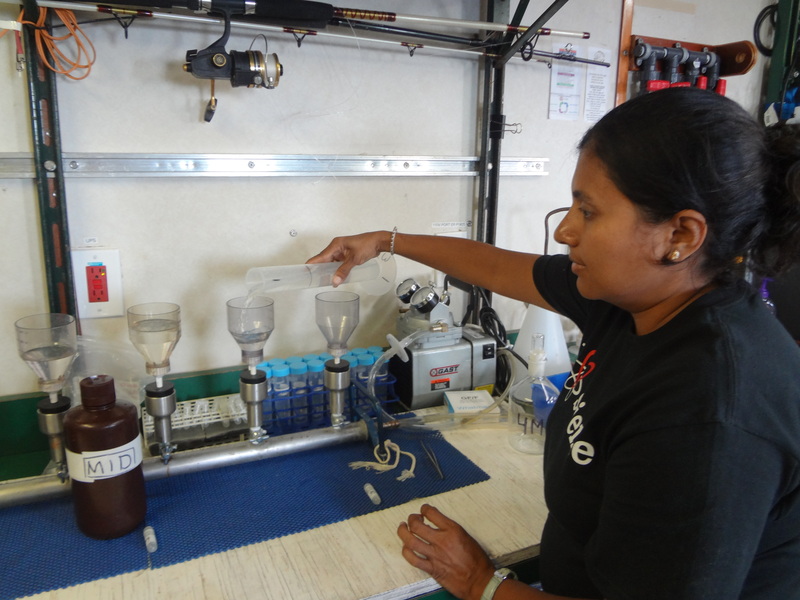 Water samples are collected to measure dissolved oxygen (these samples are analyzed all together at the end of the cruise). Determining the amount of oxygen available in the water column can help provide information about not only the fish but also other phytoplankton and more. Although we are not doing it on this leg, fluorescence can also be measured to monitor chlorophyll levels. DYK? (Did You Know? ): What exactly are transect lines? Basically this is the path the ship is taking so they know what areas the ship has covered. Using NOAA’s Shiptracker, you can see in the photo where the Oscar Dyson has traveled on this pollock survey (both Leg 1 and Leg 2) up to this point in time. Using NOAA’s Shiptracker, you can see the transect lines that the Oscar Dyson has followed during the pollock cruise until July 8. 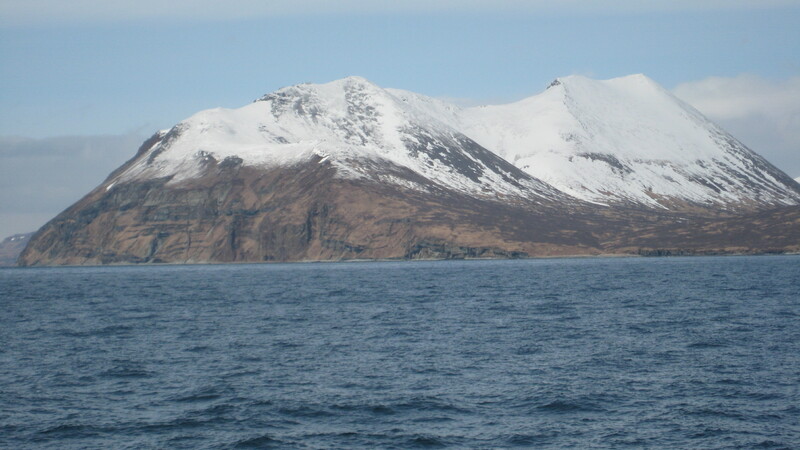 The ship started in Dutch Harbor (DH), traveled to the point marked “Leg 1 start” and along the transect lines until “Leg 1 end” before returning to DH to exchange people. The ship then returned to the point marked “Leg 2 start” and followed transect lines to the current location. The Oscar Dyson will return to DH to exchange people before beginning Leg 3 of this survey and completing the transect lines. I was lucky enough to be able to operate the winch during a CTD deploy. The winch is basically what pulls in or lets out the cable attached to the CTD to raise and lower it in the water. Special thanks to the chief boatswain Willie for letting me do this! The CTD can only be deployed when the ship is not moving, so if weather is nice, we should just stay mostly in one place. The officers on the bridge can also manually hold the ship steady. Or they can use DP, which is dynamic positioning. This computer system controls the rudder and propeller on the stern and the bowthruster at the front to maintain position. Here is a video from a previous Teacher at Sea (TAS) about the CTD and showing its “drop” into the water: Story Miller – 2010. 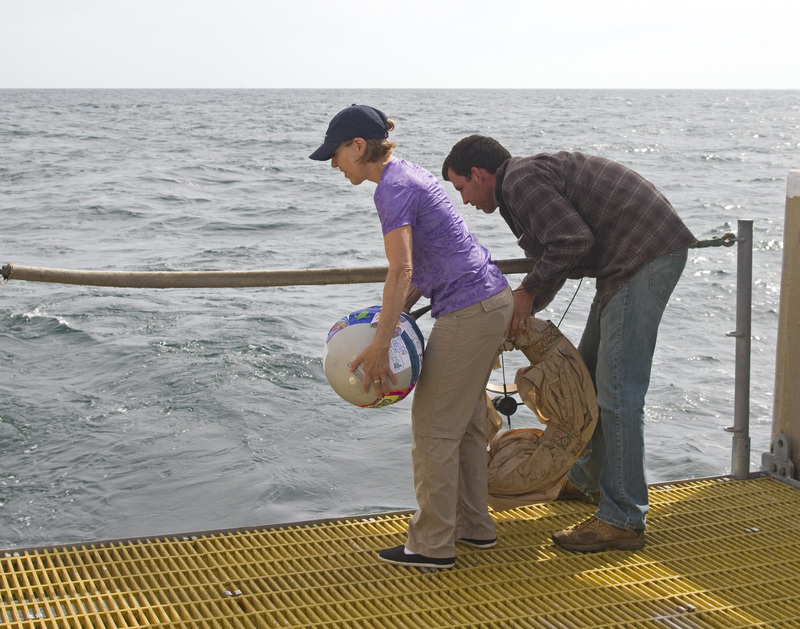 Another TAS also has a video on her blog showing the data being collected during a CTD drop: Kathleen Harrison – 2011. The thermocline is the area where the upper isothermal (mixed) layer meets the deep water layer and there is a decline in temperature with increasing depth. XBT is the acronym for the eXpendable Bathymetric Thermograph. It is used to quickly collect temperature data from the surface to the sea floor. A graph of depth (in meters) versus temperature (in ºC) is used to find the thermocline and determine the temperature on the sea floor. DYK? Normally, temperature decreases as you go farther down in the sea because colder water is denser than warmer water so it sinks below. But this is not the case in polar regions such as the Bering Sea. Just below the surface is an isothermal layer caused by wind mixing and convective overturning where the temperature is approximately the same as on the surface. Below this layer is the thermocline where the temperature then rapidly decreases. The MK-21IISA is a bathythermograph data acquisition system. This is a portable (moveable) system used to collect data including ocean temperature, conductivity, and sound velocity and various depths using expendable probes (ones you can lose overboard and not get back) that are launched from surface ships. The depth is determined using elapsed time from surface contact and a known sink rate. On the XBT probe, there is a thermistor (something used to measure temperature) that is connected to an insulated wire wound on two spools (one inside the probe and one outside the probe but inside the canister). The front, or nose, of the probe is a seawater electrode that is used to sense when the probe enters the water to begin data collection. There are different types of XBT probes depending on the maximum depth and vessel speed of the ship. 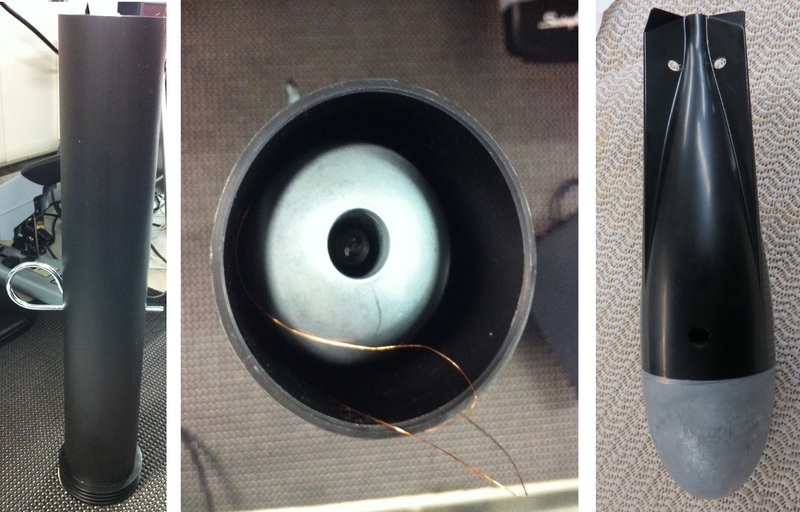 This shows a sideview (left) and topview (middle) of the canister that houses the probe (right) released into the water during an XBT. 2. Lay probe-containing canister into cradle (make sure to hold it upwards so the probe doesn’t fall out of the canister!). 3. Swing contact level down to lock in canister. 4. Pull release pin out of canister, aim into ocean, and drop probe. Important: the wire should not come in contact with the ship! “Launching” an XBT probe from starboard side on the Oscar Dyson. There is no actual trigger – you just make a little forward motion with the launcher to allow the probe to drop into the water. Be sure to check out the video below, which shows what the data profile looks like as the probe is being dropped into the water. An XBT drop requires a minimum of two people, one at the computer inside and one outside launching the probe. I’ve been working with Scientist Bill and ENS Kevin to help out with the XBT launches, which also includes using the radios on board to mark the ship’s position when the probe hits the water. 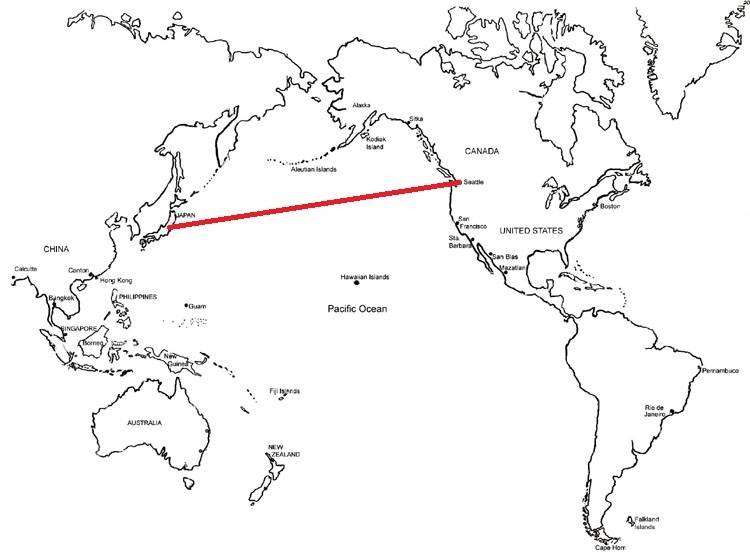 We’ve been taught in school that the quickest way from point A to point B is a straight line, so you’d think that the red voyage would be the fastest way to get from Seattle, Washington across the Pacific Ocean to Japan. But it’s actually a path up through Alaska! It’s been a little slow on the trawling during my shift recently, so I’ve had some extra time to wander around the ship and talk to various people amidst researching and writing more blog posts. I think one of my favorite parts so far has been all of the great information I’ve been learning up on the bridge from the field operations officer, LT Matt Davis. DYK? When looking at the map, you’d think the quickest route from Seattle, Washington to Japan would be a straight line across the Pacific Ocean. But it’s not! Actually, ships will travel by way of Alaska and it is a shorter distance (and thus faster). View from the bow of the Oscar Dyson. Vessels use gnomonic ocean tracking charts to determine the shortest path. Basically a straight line drawn on the gnomonic projection corresponds to a great circle, or geodesic curve, that shows the minimum path from any two points on the surface of the Earth as a straight line. So on the way to Japan from Seattle, you would travel up through Alaskan waters, using computer software to help determine the proper pathway. I’ve also had some time to explore a few other areas of the ship I hadn’t been to before. I’ve learned some new lingo (look for this in an upcoming post) and plenty of random facts. One of the places I checked out is the true bow of the ship where, if I was standing a bit higher (and wearing a PFD, or personal flotation device), I’d look like I was Rose Dawson in one of the scenes from Titanic. All of the time I spend on the bridge also allows for those random mammal sightings and I was able to see a few whales from afar on July 7! Whale sighting from the bridge! You have to look really closely to see their blow spouts in the middle of the photo. Before getting down to work, it is important to learn all precautionary measures. 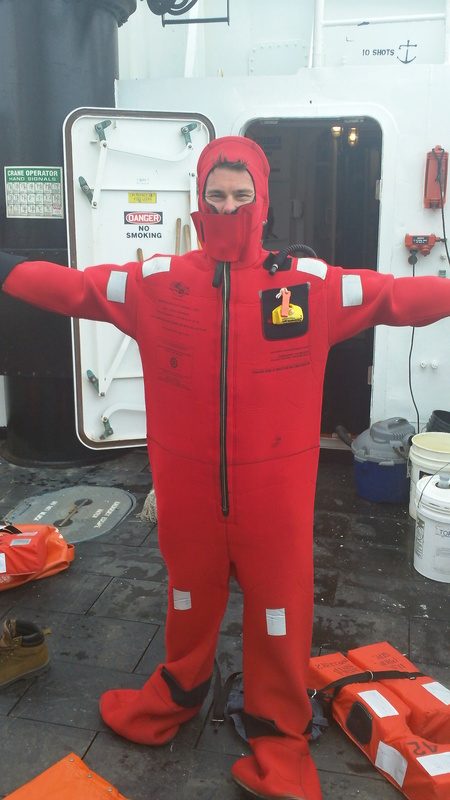 Here I am suited up in a survival suit during an abandon ship drill. After two days of travel we are on site and beginning to work and I believe the entire crew is eager to get their hands busy, myself included. 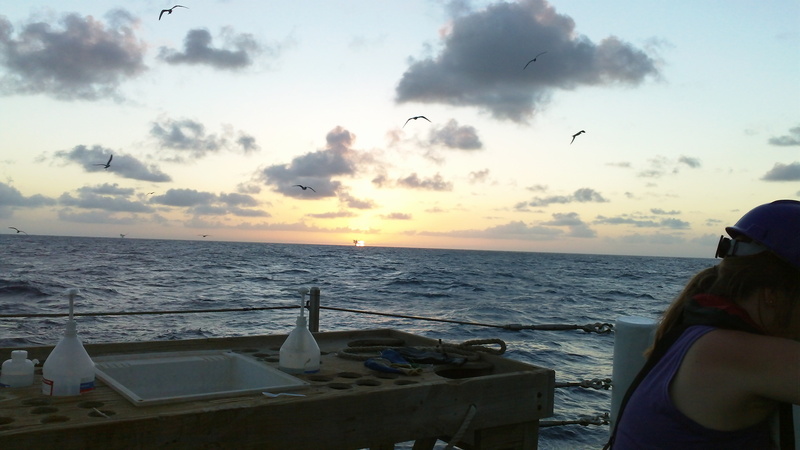 As I mentioned in my previous post, it is difficult if not impossible to separate the abiotic factors from the biotic factors, and as a result it is important to monitor the abiotic factors prior to every trawl event. The main piece of equipment involved in monitoring the water quality (an abiotic factor) is the C-T-D (Conductivity, Temperature and Depth) device. This device uses sophisticated sensors to determine the conductivity of the water, which in turn, can be used to measure salinity (differing salinities will conduct electricity at different rates). Salinity influences the density of the water: the saltier the water the more dense the water is. Density measures the amount of mass in a specific volume, so if you dissolve salt in a glass of water you are adding more mass without much volume. And since Density=Mass/Volume, the more salt you add, the denser the water will get. Less dense objects tend to float higher in the water column than more dense objects, so as a result the ocean often has layers of differing salinities (less salty water on top of more salty water). Often you encounter a boundary between the two layers known as a halocline (see the graph below for evidence of a halocline). Temperature varies with depth in the ocean, however, because warm water is less dense than cold water. When liquids are cold, more molecules can fit into a space than when they are war; therefore there is more mass in that volume. The warm water tends to remain towards the surface, while the cooler water remains at depth. You may have experienced this if you swim in a local lake or river. You dive down and all of a sudden the water goes from nice and warm to cool. This is known as a thermocline and is the result of the warm, less dense water sitting on top of the cool more dense water. Here is the fancy piece of technology that makes measuring water quality so easy: the CTD. Temperature also influences the amount of oxygen that water can hold. The cooler the temperature of the water the more oxygen can dissolve in it. This is yet another reason why the hypoxic zones discussed in my last blog are more common in summer months than winter months: the warm water simply does not hold as much oxygen as it does in the winter. The CTD is also capable of measuring chlorophyll. Chlorophyll is a molecule that photosynthetic organisms use to capture light energy and then use to build complex organic molecules that they can in turn be used as energy to grow, reproduce etc. The more chlorophyll in the water, the more photosynthetic phytoplankton there is in the water column. This can be a good thing, since photosynthetic organisms are the foundation of the food chain, but as I mentioned in my earlier blog, too much phytoplankton can also lead to hypoxic zones. Finally the CTD sensor is capable of measuring the water’s turbidity. This measures how clear the water is. Think of water around a coral reef — that water has a very low turbidity, so you can see quite a ways into the water (which is good for coral since they need access to sunlight to survive). Water in estuaries or near shore is often quite turbid because of all of the run off coming from land. 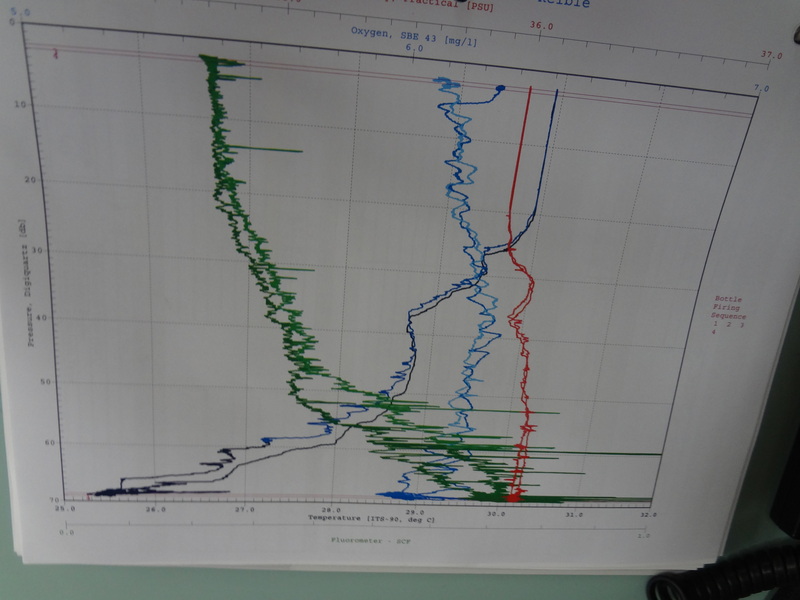 This is a CTD data sample taken on June 26th at a depth of 94 meters. 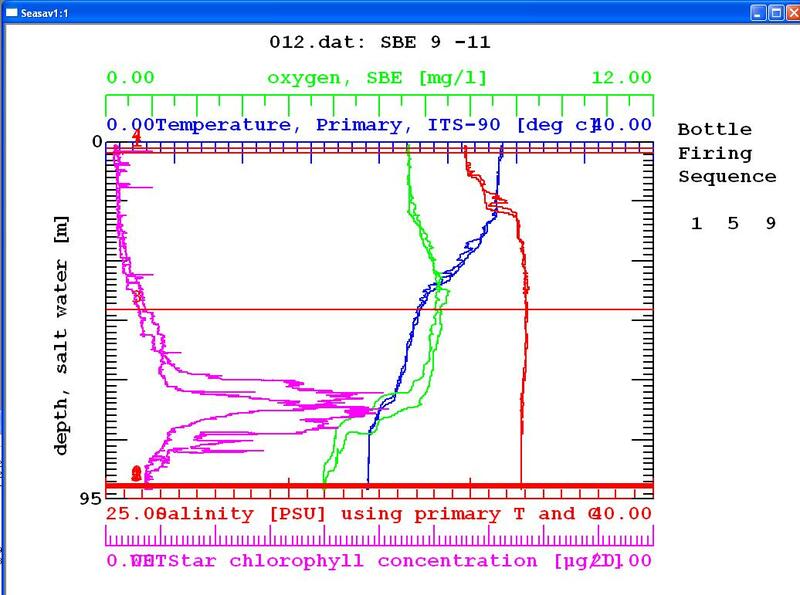 The pink line represents chlorophyll concentration, the green represents oxygen concentration, the blue is temperature and the red is salinity. So, that is how we measure the abiotic factors, now let’s concentrate on how we measure the biotic! After using the CTD (and it takes less time to use it than it does to describe it here) we are ready to pull our trawls. 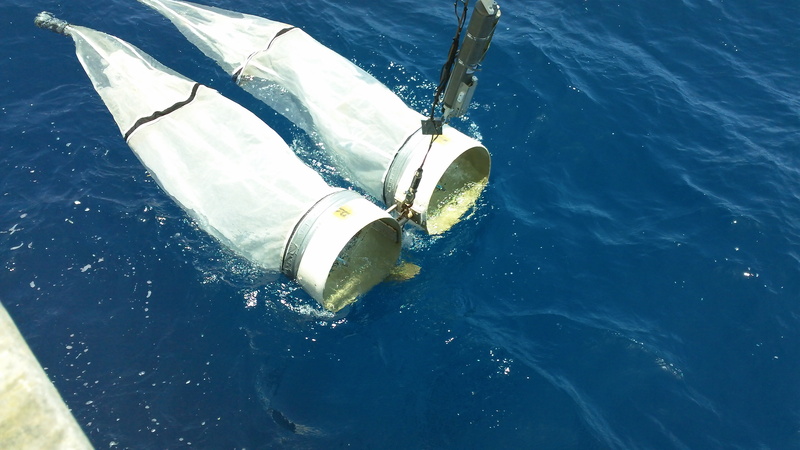 There are three different trawls that the scientists rely on and they each focus on different “groups” of organisms. 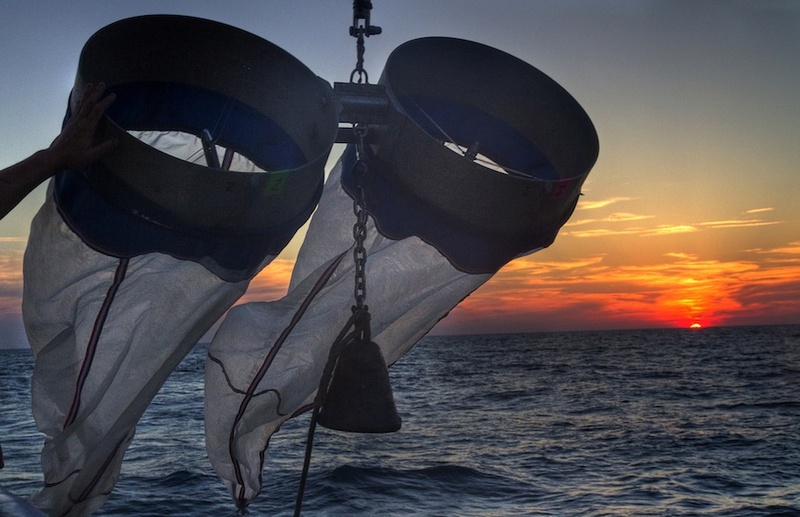 The neuston net captures organisms living just at the water's surface. The neuston net (named for the neuston zone, which is where the surface of the water interacts with the atmosphere) is pulled along the side of the ship and skims the surface of the water. At the end of the net is a small “catch bottle” that will capture anything bigger than .947 microns. 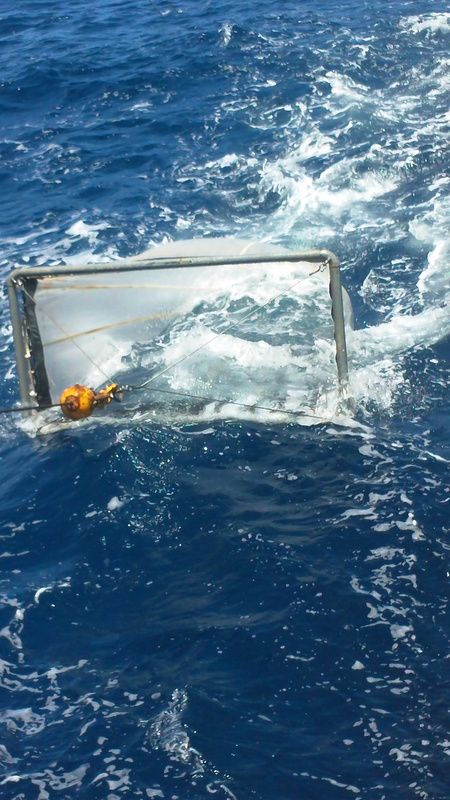 The bongo nets are nets that are targeting organisms of a similar size, but instead of remaining at the surface these nets are lowered from the surface to the seafloor and back again, capturing a representative sample of organisms throughout the water column. The neuston net is towed for approximately ten minutes, while the bongo nets tow times are dependent on depth. Once the nets are brought in, the scientists, myself included, take the catch and preserve it for the scientists back in the lab to study. 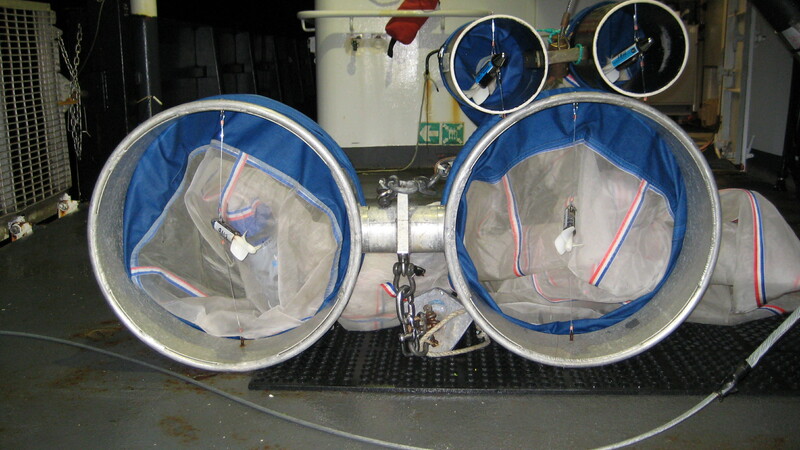 The bongo nets will capture organisms from the surface all the way down to bottom. The biggest and baddest nets on the boat are the actual trawl nets launched from the stern (back) of the boat. These are the nets the scientists are relying on to target the bottom fish. This trawl net is often referred to as an otter trawl because of the giant heavy doors used to pull the mouth of the net open once it reaches the bottom. As the boat moves forward, a “tickler” chain spooks any of the organisms that might be lounging around on the bottom and the net follows behind to scoop them up. This net is towed for thirty minutes, and then retrieved and we spend the next hour or so sorting, counting and measuring the catch. 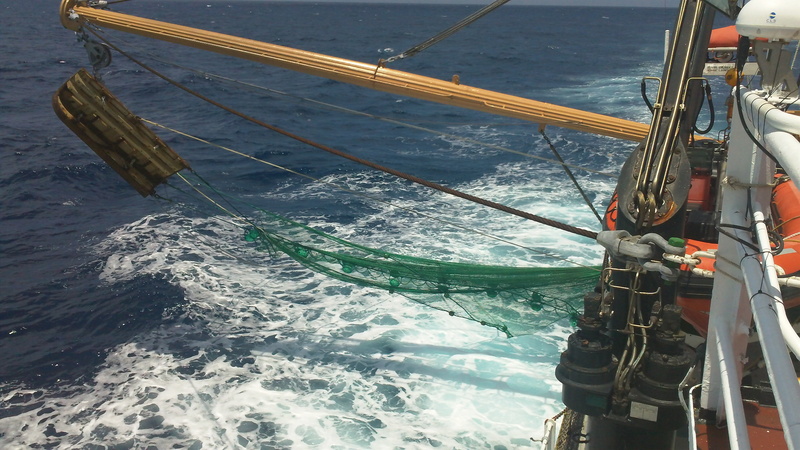 Here you can see the otter trawl net extending off the starboard side of the Oregon II. When lowered into the water the doors will spread the mouth of the net. I thought that adjusting to a 12 hour work schedule would be tough, but with a 5-month old son at home I feel I am more prepared than most might be for an extended day. I might go as far as to say that I have more down time now than I did at home! 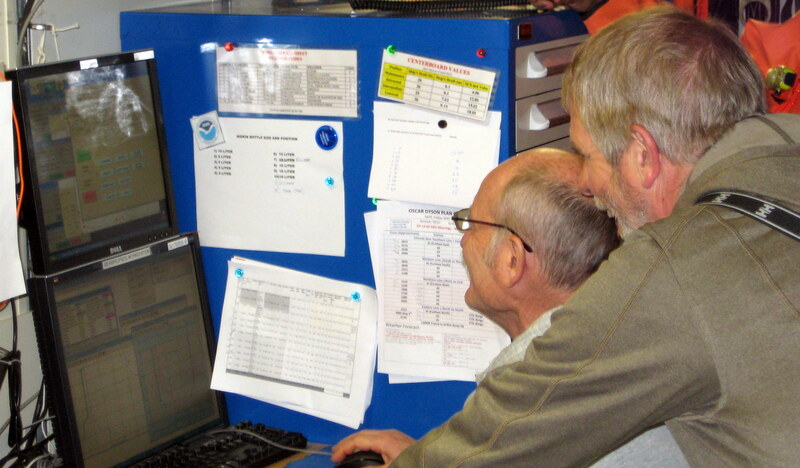 Although the ship’s crew actually manages the deployment of the majority of the nets and C-T-D, the science team is always involved and keeping busy allows the hours to tick away without much thought. 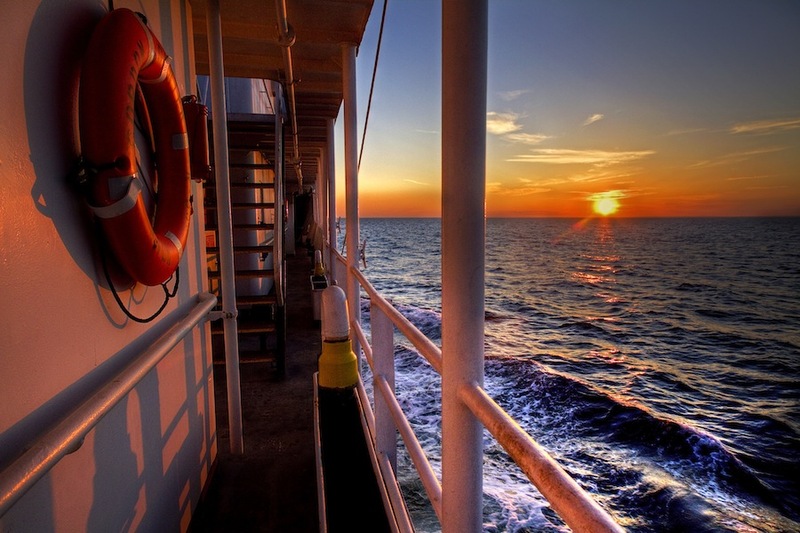 Before you know it you are on the stern deck of the ship staring at a gorgeous Gulf of Mexico sunset. As we steam back East, the sun sets in our stern every day, and we have been treated to peaceful ones thus far on this trip. The sun has long since set. As I write this it is well after midnight and my bunk is calling.